In keeping with today's theme of posting up relevant and interesting links, I'd like to run an announcement from Exfanding friend Kevin Powers, who has just launched a new and very cool Web site featuring some of his original writing. I've read some of the stories up on his Web site now and some he hasn't yet posted (I even edited a couple! ), and they are fun and well-written. If you're a fan of the Old West, then this site will be right up your alley. Check it out, and if this sounds like something you're into, then by all means go visit the site! Kevin Powers, creator and purveyor of the Creator-Owned Blog and longtime reviewer and news editor at comic book website Comics Bulletin, has launched an innovative and groundbreaking new website that features short stories taking place in the Old West. 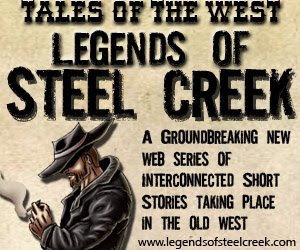 The site is entitled "Legends of Steel Creek." The stories will be only a few pages long and will all take place within the fictional town of Steel Creek, Arizona, in the days of the Old West. The stories aren’t necessarily revealed in chronological order, but they are all connected to one another through the characters and events that transpire. “Legends of Steel Creek” will primarily focus on two individuals and the people around them. At one end of the spectrum is bounty hunter Jim Hammer who fits the classic Clint Eastwood-style, Western hero archetype. He is a stoic and dangerous man who, for personal reasons, also has an itch to kill any general, Union or former Confederate that he comes into contact with. Seeing your name made me realize that all this time I've been confusing you with someone else... and that the other person's name is Alec, not Alex. Uh-oh! Hopefully you don't think less of me as a result!